Sand duning, Sand drags, Sand rails; see Glamis and Sand Mountain on video! If sand motorsports action trips your trigger, then you've come to the right place. From start to finish, this DVD never lags, it just keeps coming at you. Buggies, sand rails, jeeps, bikes, quads, you name it, you'll find it in this action-packed movie. You'll find everything, that is, except drunkards driving through fire and the same footage repeated over and over. 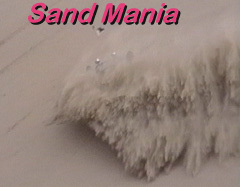 This wasn't a one-weekend shoot; Sand Mania took years to complete, mostly because of the multiple locations, the harsh environment, and all of the on-board camera action. Are you tired of seeing the same old quad and motorcycle jump footage? Sand Mania is all about real sand duning, with extensive coverage of sand rails running at Dumont, Sand Mountain, and of course Glamis. There are multiple on-board camera sessions that put you up front and center in a big way. This tape was made by, and for, hard-core duners. If you are new to the sport, or just simply curious, you'll be able to get a feel for what it's like to really go sand duning. If you like the sand drags, you'll get to see all the usual suspects running at Glen Helen, Marysville, and especially Rocky Point, Mexico. Some of this footage from Mexico includes a rather unique perspective of the track. The cameraman risked his life by standing just a few yards beyond the finish line, right next to the track. From this vantage point you'll see top fuel dragsters doing the hundred yard dash in under three seconds. Those paddle tires really move some sand! The music for this video was handled by several bands, including: Noxious Emotion, Spredhaus, and Hicky. These bands rock, be sure and check 'em out! 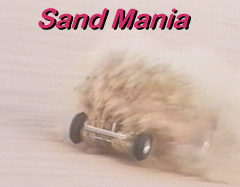 Viewing this DVD video is contagious, so watch it at your own risk, because there is no known cure for SAND MANIA! This movie is 50 minutes long, and costs $25.